We’re creeping toward the middle of December, which means the Christmas holiday will be here before we know it. Each year, the holiday season is a time of joy spent celebrating with friends, families and loved ones. But a big part of the holiday season for many people is also the tradition of gift-giving. Choosing the perfect presents for loved ones can sometimes be a difficult, stressful task – especially if that special someone is a man. We men don’t always make it obvious what we want to see wrapped in pretty paper underneath the Christmas tree, but trust me; we have some ideas swirling around in our heads. If you’re not sure what to get your dad, son, brother, boyfriend or husband this year, don’t worry. We’ve got you covered. Of course, you might have already thought of this, but it’s sure to be a winner. Every man needs a nice toolset to keep in their workshop, garage, man cave, or maybe even under the kitchen sink. 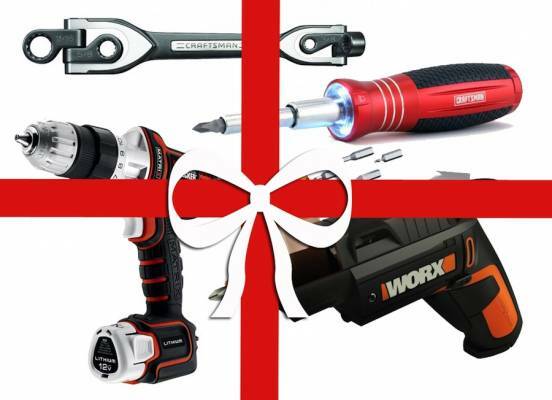 Look for tools that come with warranties – several come with lifetime warranty options, so your gift will keep giving for life, even if one of the tools is damaged or broken. If you have a long driveway or a lot of area to shovel, your guy would definitely love a snow blower. Check out our 2013 Ultimate Snow Blower Buying Guide to find the right one for your household. If you want to give your guy a tool that’s fancier than a new hammer or wrench, think about buying him a fancy knife. The kind of knife that has a wooden or bone handle; the kind of knife a guy can were around in his pocket or on his belt; the kind of knife that is passed down from generation to generation. This isn’t so much a practical tool as it is more of a manly accessory – think of it as the grown up, classy version of the classic Swiss Army knife, but without so many functions. Men love technology, and 2013 has been a great year for new and innovative tech creations. For the business man or geeky guy that likes to have everything at his fingertips, you can choose from myriad tablets. We love the iPad Mini – it’s the perfect size to carry around in a bag, and it comes with a more affordable price tag. For the TV lover, you’ve got Chromecast, which connects your smartphone or tablet to your TV to play YouTube, Netflix, HBO Go and Hulu, at only $35. Or, for the music lover in your life, take a look at Sonos Play One, a portable, wireless audio system that connects to internet music channels and your iTunes library. Boys will be boys, and we’ll always love to play video games. Plus, I heard somewhere that playing video games help to keep your memory sharp, so there are health benefits, too! The Xbox One and PS4 are the hottest next-gen consoles on the market right now, and both appeal to different kinds of gamers. Do some stealthy research and ask your guy’s friends which console he would prefer to be sure you’re making the right choice. Every man needs a nice watch, and there’s something to fit all personalities. If the man you’re buying for is a tech geek, but he already has all of the ideas listed above, you could get him a new smart watch. Sony’s SmartWatch is Android compatible and connects you to your calls, social networks, emails and favorite apps, all while leaving your hands free. Or, for the more classic gentleman, there’s always the more luxurious choice of a Rolex, Omega, Seiko or Fossil – something for every budget. Men love beer, end of story. If your budget is small, you can easily make these fun and festive “reinbeer” using a six pack of your guy’s favorite craft beer (see tutorial here: http://lifeofamodernmom.blogspot.com/2010/11/reindeer-rootbeer-beer.html). If you have more money to spend, a “beer of the month” club membership is definitely going to be a winner. There are so many options out there for beer of the month clubs – choose from domestic beers, international beers, or a mix of the two. A variety pack of craft beer will be delivered to your guy once a month and he’ll start to look like a craft beer connoisseur to all of his friends. What else would you add to this list? Share your ideas in the comments section!